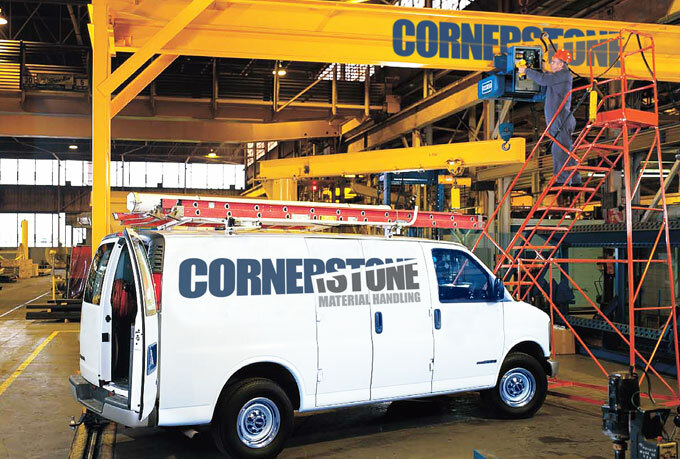 Cornerstone Material Handling Inc. is one of the leading distributors of Overhead Cranes, Hoists and Below-the-Hook Lifting Tools. With over a century of experience, Cornerstone prides itself in its vast knowledge of the products we represent and top notch customer service we provide to our growing customer base. Located in beautiful St. George (Brant), Ontario, our central location provides our customers with quick responses to all of their needs, from parts and products, to on-time 24-hour service. Our large warehouse remains stocked with a wide array of OEM parts, and we remain committed to getting those to you the second your business requires them. Our service team is second-to-none in the industry and is at your beck and call, 24 hours a day. Whether quick repairs are needed in a breakdown situation, or a scheduled inspection in required, we’ll be there when you need it. For more information on what Cornerstone can do for you, please feel free to contact our customer service team.